As Samajwadi Party chief Akhilesh Yadav has joined hands with Mayawati-led Bahujan Samaj Party to dethrone Prime Minister Narendra Modi-led Bhartiya Janta Party from power in 2019 Lok Sabha election, SP Patriach Mulayam Singh Yadav different point of view. 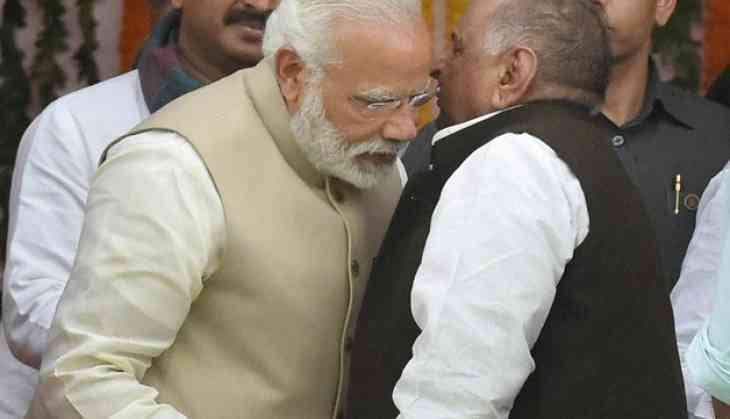 Mulayam Singh Yadav, founder of SP, backed PM Modi in Lok Sabha today and said he want him to see Narendra Modi back as Prime Minister. He said that he hope that Narendra Modi get another term as Prime Minister. Sonia Gandhi was sitting beside Mulayam Singh when he openly showcased his support for PM Modi and praised his work. As Mulayam heaped praise, PM Modi smiled and folded his hands in gratitude for the words of appreciation.